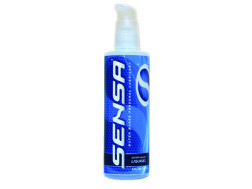 SENSA® Liquigel is our traditional water based personal lubricant. Scientifically formulated for safety, purity, and long lasting lubrication, SENSA® Liquigel has a thicker formulation so that it stays where you want it. Sensa® Liquigel is available in 4 FL OZ and 8 FL OZ sizes. 4 FL OZ sizes feature a convenient press top applicator while the 8 FL OZ size features a convenient metered pump that is lockable to prevent leaks. SENSA® Liquigel is latex safe and is non-staining.